Well-known margarine brand Flora has changed the recipes of its spreads which are now 100% plant-based, Upfield has announced. Upfield purchased Flora from Unilever in December 2017, and are supported by vegan chef Alexis Gauthier of plant-based restaurant Gauthier Soho. 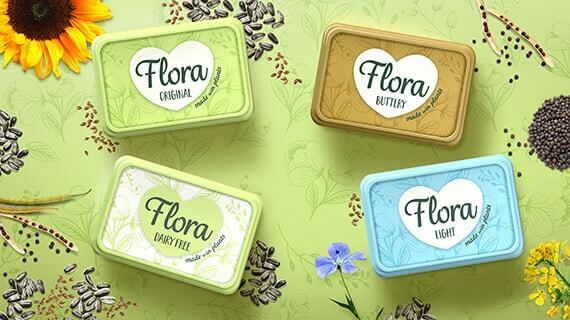 The reformulated Flora range – Flora Original, Flora Light, Flora Buttery, and Flora Dairy Free – are made without preservatives, artificial colours or flavours, and suitable for vegans, approved by the Vegan Society. The spreads are available in stores from 18 March, and will be supported by a TV campaign later this year.